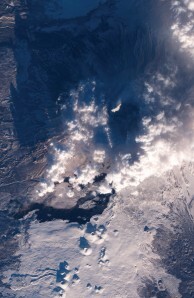 On the Kamchatka Peninsula in the far northeast of Russia, four volcanoes—Shiveluch, Bezymianny, Tolbachik, and Kizimen—were erupting when NASA’s Terra satellite captured this image during a single orbit on January 11, 2013. 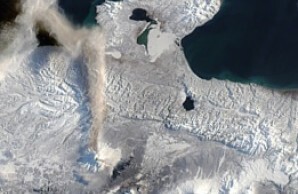 Ash can be seen drifting east from Shiveluch. 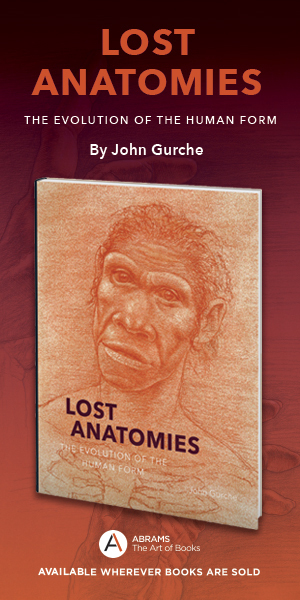 Reprinted with permission from Volcanoes: Encounters through the Ages by David M. Pyle, published by the Bodleian Library, University of Oxford, and distributed by the University of Chicago Press. © David M. Pyle 2017. All rights reserved. The past 150 years have seen a dramatic change in our ability to measure activity at volcanoes, whether they are dormant, or in eruption. New instruments have been designed that can measure earthquakes, sound, gases, and heat at volcanoes, either from the ground or from space. Many of the world’s most active volcanoes are bristling with sensors, beaming back their measurements by cable, Wi-Fi, or mobile phone to the nearest observatory. Fleets of satellites form a global network, like a remote observatory, with on-board sensors detecting changes in the shape of the volcano, or in the amounts of heat and quantities of different gases escaping out of the volcano. In recent years, new global networks of instruments have all been used to spot eruptions that otherwise may have gone unnoticed: the global lightning network; the global infrasound arrays, used to detect very low frequency sounds that bounce around the globe after nuclear explosions; and the ocean buoy network used to measure sounds in the deep channels of the world’s oceans. Kizimen was still active in March 2013. A plume is rising from the summit. 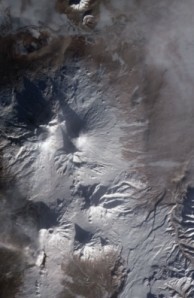 Snow covers a lava flow on Kizimen’s eastern flank. Today, scientists can measure the properties of rocks deep beneath our feet, and start to try and test ideas about where molten magma might form or accumulate before an eruption. But there is still a long way to go. Just because we can measure things doesn’t mean that we can understand what those measurements mean. And since much of the history of the study of volcanoes has focused on their behavior when they are erupting, we have a very poor idea of how some volcanoes behave when they are not erupting. Equally, at volcanoes that have been long dormant, and are perhaps very quiet, we may have very little idea of the clues that might signal that an eruption is about to happen. Our capacity to record volcanic activity has also been transformed. Before the arrival of the camera, visual records of eruptions could only be snapshots, drawn as fast as the sketcher was able; or composite images that captured some of the features of the eruption. Today, streaming video and webcams mean that we can watch events unfurl from our desktop computers and mobile devices; and then we can go back and watch them frame by frame. Weather satellites capture the spread of ash clouds and their tracks around the globe. While this flood of digital information may mean that we can see more quickly what is happening, it poses new problems for storage and archiving. No one has yet designed a system for quickly reducing these data flows to the “key performance indicators” that might best help describe what is happening now, and diagnose what might happen in the future. The rapid and ready availability of digital imagery, and the ease of sharing this information widely, through social media, for example, is not always a good thing. Misinformation can spread just as fast as any other sorts of information; and in the hurly-burly of a rapidly unfolding event, recycled images of past events can quickly be adopted as “true likenesses” of the new. As with imagery from past eruptions, it can be hard to detect embellishment or exaggeration in the heat of the moment. Image of Tolbachik made from a combination of visible and infrared light. Both this image and the natural image show volcanic plumes and a lava flow. Tolbachik began erupting in late November 2012, after being dormant for 36 years. 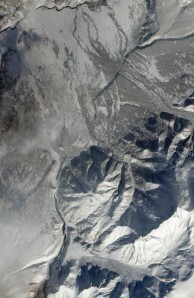 NASA's Earth Observing-1 (EO-1) satellite captured two views of Tolbachik on December 1, 2012. Pictured is Tolbachik in natural color. The monitoring of volcanic activity on the Greek islands of Santorini is an example of what is possible to detect at volcanoes that are starting to show unrest. Santorini, also known as Thera, is a spectacular group of islands gathered around a huge flooded crater in the Aegean Sea. It is one of the best exposed and most accessible volcanic islands in the world, and has played an important part in the development of the science of volcanoes. Santorini was well known to the natural historians of the ancient world, and has continued growing in eruptions for at least the past 3,000 years. From satellites, the arcuate form of the main islands of Santorini is easy to see. Look more closely, and you’ll see the inconspicuous dark shadows of the two youngest volcanic islands—the “burnt” or Kameni islands—that lie within the great flooded caldera. These islands form the literal “tip” of the present-day volcano, which has grown up within Santorini’s caldera since the last major explosive eruption, the Minoan eruption of ca. 1600 BCE. Historical records and accounts from as far back as the Greek geographer Strabo suggest that there have been at least ten eruptions in and around the Kameni islands since 197 BCE. It is quite likely that there have been more that either weren’t noticed (because they were underwater), or that have been forgotten with the passage of time. Indeed, it has been suggested that the ancient city of Cyrene, in present day Libya, may have been founded in 630 BCE by Greeks who were escaping an earlier eruption of Thera. The Kamchatka Peninsula, with 160 volcanoes, 29 of which are active, has the highest concentration of active volcanoes on Earth. This satellite image shows Shiveluch, Bezymianny, Tolbachik, and Kizimen during their dormant stage. The four volcanoes are separated by only 110 miles. 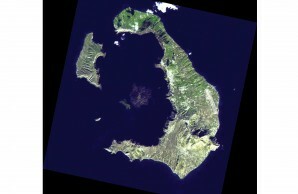 The present day Kameni islands have a volume of about 3 cubic kilometers of lava, measured from the sea-floor, and must have grown at an average rate of about 1 million cubic meters per year ever since the Minoan eruption. Mapping of the sea-floor reveals the intricate details of the underwater shape of the Kameni islands, and allows geologists to work out the sequence of eruptions that formed them. Because Santorini is accessible, it is quite closely observed; there are many maps and sketches of the ways that the volcano has changed during eruptions over the past 300 years. In January 2011, Santorini began to show subtle signs of stirring after many decades of quiet—or at least many decades without detectable activity. Tiny earthquakes began to be detected beneath the center of the volcano. These were too small to be felt, but were large enough to be picked up by the local Greek network of seismometers. For the first time, there were more earthquakes occurring beneath Santorini than at its neighbor; an underwater volcano called Kolombos bank, 15 kilometers away. Shortly afterward, we began to see signs of ground movement from radar instruments on satellites and from sensitive ground-based GPS instruments, showing that the whole volcano was beginning to swell. The northern end of Nea Kameni was rising out of the sea at a rate of a few centimeters per year, and all the circling islands of Santorini moving outward, away from the center of the caldera. Apart from a small number of sharp earthquakes that were felt locally, there was nothing significant that would have been noticed without monitoring technology. The way that a volcano swells tells us about where the pressure source lies. Imagine blowing up a balloon that is buried within a sandpit. If the balloon is very deep, the disturbance at the surface will be quite small, and spread out. If it is shallow, the sand will bulge dramatically over the top of the expanding balloon. 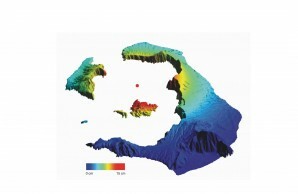 Computer simulations of this swelling suggested that the cause of the unrest was the arrival of a small blob of molten rock at about 4 kilometers beneath the volcano, somewhere under the northern part of Santorini’s sea-filled caldera. 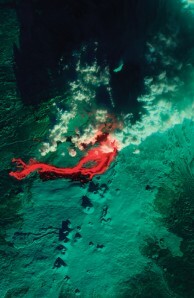 NASA satellite image of the Greek island Santorini in the south Aegean Sea, which has been showing signs of unrest for the first time in over half a century. Model of the vertical movement of Santorini during 2011-2012, caused by the intrusion of a pool of magma at 4-kilometers depth. The red dot shows the location of the center of the magma chamber. For the 15 months until April 2012, our instruments traced out the gradual changes at the surface as twenty million cubic meters of molten rock slowly squeezed into this subterranean reservoir. Hundreds of very small earthquakes continued to rattle the volcano until January 2012, when they began to peter out. There were also subtle changes in the gases leaking out of the summit craters of Nea Kameni islands. The concentrations of these gases were so low that they had to be measured directly during field campaigns. By making repeated measurements across a grid using a small bell jar connected to a pump and a sensor, we could measure the small amounts of carbon dioxide escaping to the atmosphere from the surface of Nea Kameni. Early in 2011, the pattern of soil-gas carbon dioxide changed, as new gas percolated into and through the shallow parts of the volcano toward the surface. This gas pulse has now passed through the system, and since April 2012, all the signs suggest that the volcanic system beneath Santorini has returned to a quiet state. 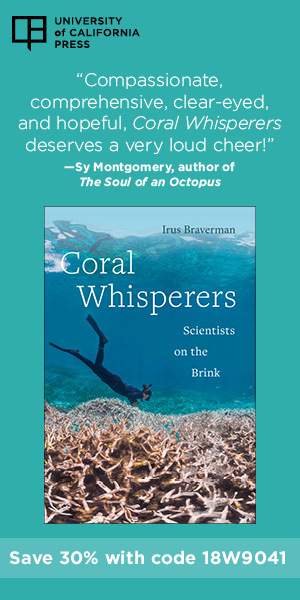 If this short and subtle episode of unrest had happened more than thirty years ago, it would not have been detected: without the satellite instruments, and local seismometer network, there would have been too few clues that anything might be amiss. New batches of magma must be arriving repeatedl in the magma storage systems beneath slumbering volcanoes. It seems likely that this is how volcanoes slowly prepare for a future eruption; growing drip-by-drip until eventually they are ready to erupt. But we have no way of working out how often these events might have happened in the past, nor of what they might tell us about the future, simply because they are too subtle and too transient to leave any trace in either the historical or geological records of volcanoes. The geological and historical records of past eruptions have strong parallels: both have detection thresholds, below which little or nothing will be recorded or preserved. In both, records are also likely to be biased toward the extraordinary. 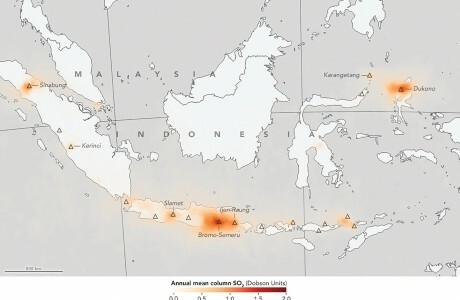 Data from NASA Aura satellite observations, represented in shades of orange, show volcanic sulfur dioxide emissions from Indonesia’s many volcanoes. Every year, new volcanoes return to life after a long period of repose. Sometimes, there may be an extended warning; but at other times, there may be very little. The reawakening of a long-dormant volcano poses one of the biggest challenges to volcanologists, simply because these volcanoes will not usually have a well-established track record of behavior. In the past fifty years, several of the most troublesome eruptions have been at volcanoes that have erupted for the first time in recorded history. The two most significant explosive eruptions of the past forty years both occurred at volcanoes that were barely known before a fanfare of earthquakes announced their arrival: El Chichón, Mexico, in March 1982; and Pinatubo, Philippines, in June 1991. At Pinatubo, only three months elapsed between the first felt earthquakes and the main paroxysmal phase of the eruption: just long enough to identify the potential hazards posed by the volcano, and to start to prepare the millions of people who lived within reach of the ash clouds and mudflows that were expected to accompany an eruption. One of the most dangerous volcanoes currently in eruption is Mount Sinabung, a large stratovolcano surrounded by farming lands, on the Indonesian island of Sumatra. In August 2010, the first historical eruption of Sinabung ended at least 400 years of dormancy. Since then, activity at Sinabung has waxed and waned, with repeated episodes of violent eruption, triggering large-scale evacuations of several tens of thousands of people from communities at the foot of the volcano. The most damaging activity a Sinabung is caused by the break-off and collapse of the hot, viscous front of a slowly extruding lava flow. This hot rock avalanche quickly transforms into rapidly moving pyroclastic flows that sweep off the flanks of the volcano. Sinabung is closely monitored by the Indonesian national volcano monitoring agency, but the variable intensity of the eruption, its long duration, and its accessibility mean that people often enter the formal exclusion zone, whether to tend to their fields and livestock, to recover belongings, or for tourism and other reasons. There have been several times when rapid changes in activity have led to multiple fatalities, as people are engulfed in searing clouds of hot ash. Eruptions of this style, like that at Unzen, Japan, in 1991 and at Montserrat in 1995, are inherently unpredictable, even when closely monitored. In April 2015, Calbuco volcano in Chile burst back to life with less than two hours of warning, after over 40 years of silence. In the era of global satellite monitoring and with proliferating networks of instruments on the ground, why can we still not predict volcanic eruptions? Our capacity to watch, record, and comment once an eruption has started is not yet matched by our ability to anticipate what might happen next at a restless but dormant volcano. 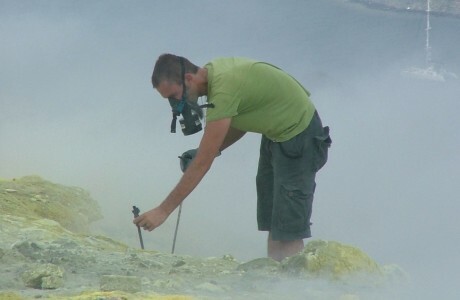 Collecting volcanic gas from the steaming sulphur-coated summit of Vulcano, the Aeolian Islands. Lipari Island is in the background. While we can’t yet safely drill into a rumbling volcano, the deposits from past eruptions may contain the information we need about what happened in the build-up to those eruptions. Any volcanic activity that involves the eruption of solid materials (or materials that will become solid) will have the potential to leave a trace in the geological rock record, whether as a layer of volcanic ash preserved in a lake, peat bog or soil, or the frozen remnants of lava flow, or similar evidence. If these deposits are not too badly affected by weathering and alteration processes, they can be collected and analyzed. The physical nature of the samples and what they are made of (minerals, glass) can be used to understand where and how they formed, and how they were erupted. However, the geological record is imperfect, and the deposits of many smaller to moderate eruptions are only transient and unlikely to be preserved. But for some eruptions from the eighteenth to the twentieth centuries, fresh samples collected at the time can still be found in museum archives: from date-stamped lavas erupted from Vesuvius, to date and time-stamped ash samples collected on land, or at sea, during the 1902 eruptions of the Soufrière of St Vincent and Mont Pelée on Martinique, carefully retained, and available for modern analysis, in ways that would not have been imagined at the time. Explosive eruptions typically throw out large quantities of ejecta—the frozen and disrupted remnants of the eviscerated magma reservoir. This often includes pumice: a light and frothy rock that is a network of tiny glassy tubes, sheets and strands, with a void space now filled with air, and would have contained volcanic gas just before eruption. Other components include crystals of different minerals that grew at depth, as the magma cooled and started to solidify, perhaps for decades or centuries. These bubbles are thought to be the main agent that causes explosive eruptions. At depth, when fresh magma first arrives beneath the volcano, it usually contains quantities of dissolved gases, such as water and carbon dioxide. As the magma freezes, the gases remain dissolved in a smaller and smaller amount of melt, until eventually the melt becomes saturated, and bubbles of gas start to form. From this point, the pressure inside the volcano will begin to build, and eventually, rocks around the magma chamber will crack; bubbly magma will rise through the crack to the surface and start an eruption. But how can we find out the point at which the magma starts to grow bubbles? This is where forensic volcanology comes in. As magmas freeze, the crystals formed at different times will capture snapshots of the state of the magma reservoir beneath the volcano. With some good fortune, it is sometimes possible to find these crystals after an eruption, and piece together the sequence of events. Some minerals that are common in volcanic rock have turned out to be particularly good time capsules. The green olivine crystals that are often found in basalts can be used to tell us about the temperatures at depth, where they first formed. Often, olivine crystals may trap tiny blobs of liquid magma, deep in the bowels of the volcano. With luck, these tiny blobs will freeze to glass droplets when the olivine crystal is eventually ejected from the volcano; they can then be used to find out more about the magmas at depth. 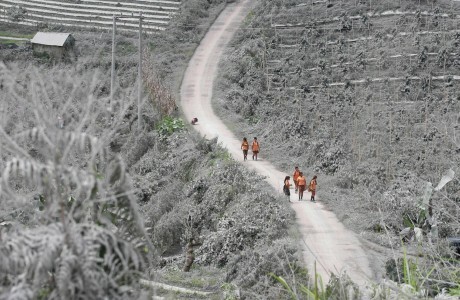 Surrounded by fields covered by ash fall, school children walk along a road in Kebayaken, North Sumatra, Indonesia, on Saturday, November 9, 2013, after the eruption of Mount Sinabung. Interest in global geophysical catastrophes strike a chord with the public; and none more so than Yellowstone, and supervolcanoes. The term “supervolcano” was popularized as the name of what might happen in a future eruption of Yellowstone, a caldera volcano in Wyoming that has had three colossal explosive eruptions, and many smaller ones, in the past 2 million years. The term has come to signify a catastrophic volcanic eruption, in the same way that Krakatoa came to symbolize volcanic disaster a century ago. Even though the chance of an eruption of supervolcano scale in our lifetimes, involving the explosive eruption of over a thousand cubic kilometers of ash and pumice, might be vanishingly small, it wouldn’t take an eruption of that scale to have a global impact. Tambora, in 1815, disgorged about a tenth of this amount of material, and left an unequivocal signal in global environmental records. Leaving alone the medium-term environmental consequences, a repeat of a Tambora-scale event would have immediate consequences for global transport, trade, and financial flows on a scale not realized by any previous volcanic eruption, and likely exceeding the impacts of the world’s two most recent geophysical catastrophes: the 2004 Indian Ocean earthquake and tsunami, and the 2011 Tohoku earthquake and tsunami in Japan.